Within the framework of the working visit to our school the Head of the Charitable Foundation Poroshenko – Marina Poroshenko visited our school. Together with the head of Cherkasy Regional State Administration Yuriy Tkachenko, Maryna Anatoliivna visited classes which educate children with special educational needs. Children were able to communicate with guests, talk about their school life, leisure activities and future plans. 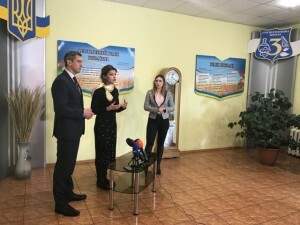 School-based signed a memorandum of cooperation, under which Cherkasy region joined the national project “Inclusive education – the level of consciousness of the nation” and was the 10th region of Ukraine, in which it is implemented.